bare•bones e-zine: The Warren Report Issue 1: Creepy! The Warren Report Issue 1: Creepy! Eerie #1, published in 1959 by Hastings. Frank Prentiss is a bit perturbed that his wife has become fond of "Voodoo!," but what else is a girl to do for kicks when she lives in the jungle with a loser of a husband? Things get heated when Sylvia brings a shrunken head home and Frank banishes her from the hut. The angry woman then uses black magic to draw Frank out into the jungle and attempts to decapitate him, but the plan goes awry and it's Sylvia who ends up without a noggin. 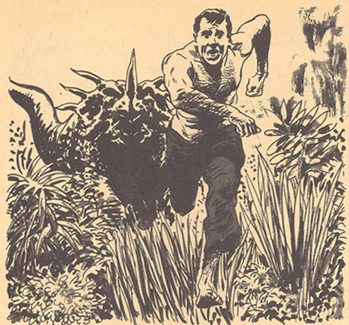 Terrified, Frank bolts into the jungle but soon hears the chant of his name, as if called by the dead woman. A figure approaches him and, sure enough, it's Sylvia, with a very tiny head atop her shoulders, come to claim her prize. In both art and script, "Voodoo!" is doo-doo. We've just come from evaluating a whole lot of bad Joe Orlando art and this, if anything, is worse than his EC work. Time may be playing tricks on my mind but I recall Joe's work with DC on House of Mystery and Witching Hour (a few years after this first issue of Creepy) was at least tolerable, but "Voodoo!" looks like something that would have fit comfortably in a Myron Fass publication. We get no explanation for the fact that Sylvia is beheaded and then, magically, has a shrunken head attached to her body. 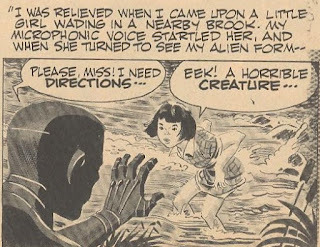 Jones and Pearson seem content to go for the shock rather than supply a well-written story, just like many comic writers who grew up on a steady diet of EC Comics (Jones was only 22 years old when this first Creepy was published and he was the first editor to boot!) and believed it was the final shock panel that delivered the goods every time. A young couple explore an undersea kingdom located just below the waves in "H2O World" and come across a peaceful but human-shy race of amphibious creatures. Their leader explains that, after World War III, his race decided to have nothing to do with the surface world. The memory of the undersea world is wiped from the minds of the couple and the fish-leader muses that, eventually, man will destroy everything. An early example of ecological fiction, a genre that would be dipped into several times in the Warren era. Neither better nor worse than a lot of the "preachies," "H2O World" suffers from a sense of being a small part of a larger story. How did the young couple stumble onto this find and why aren't there more explorers? Writer Larry Ivie had an illustrious career in the funny books and monster magazines, which included contributing to the classic Castle of Frankenstein, and editing and publishing Monsters and Heroes, a very weird melange of monsters, heroes, and photography. Like Joe Orlando, Williamson and Krenkel were rescued from post-EC purgatory for Warren's big hoo-hah. 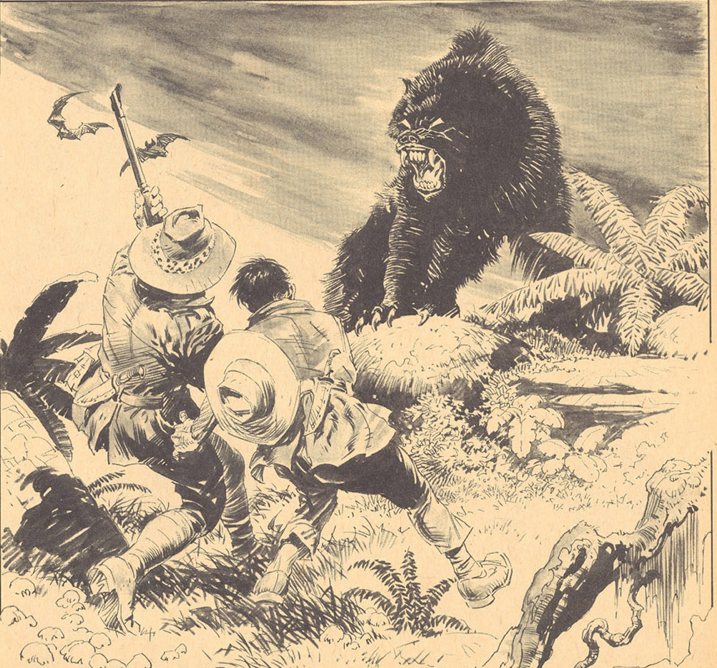 Williamson had been working on comic strips and on comics over at Gold Key, while Krenkel had pretty much disappeared from the face of the planet. "H2O World" is just as gorgeous as the work the duo did a decade before for EC. In "Vampires Fly at Dusk!," Elena believes her husband may be the vicious vampire killer draining the nearby villagers of their blood. Cooped up in a mansion high upon a hill overlooking the plagued village, Elena's imagination runs away with her. Why does Carlo prefer to sleep during the day and do business at night? Why does he disappear for hours at a time? Why is Carlo's library full of books on vampires? One night, while snooping around, Elena discovers a secret passageway into the castle and encounters Carlo entering with a jar of blood. Terrified, the young woman races downstairs and pulls the curtains open on the rising sun. Bad idea. Carlo explains to Elena that he's not the vampire, as her body turns to dust. Even though the "twist" is a surprise to no one but Elena, I liked this very EC-inspired tale very much. 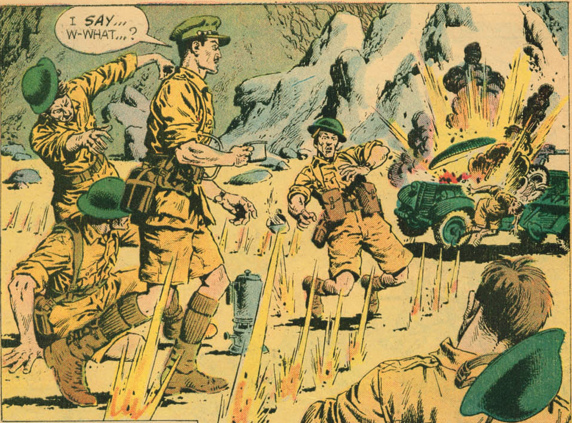 Reed Crandall's pencils and line work (especially on the last page) are glorious, sheer perfection. Many fans feel Larry Ivie's "Werewolf!" is the single greatest story Creepy ever ran; not for the story, obviously, but for the ultra-rare, full-length Frazetta work. While I'm not in that group, I'll allow it's hard to argue with the quality of the visuals. The fabulous art overshadows what is essentially a reworking of “The Most Dangerous Game.” Big-game hunter Biff Demmon (a dead ringer for Ernest Borgnine) tracks the ultimate game in Africa, but when he finally comes across the rare beast, the tables are turned. The third panel of the fourth page depicting the werewolf hulking over the hunters is a classic piece of art, one that Warren brought out many times over the years. It's a shame that Warren couldn't persuade (or offer enough coin to) Frank to contribute more longer pieces but, at least, we've got the multitude of classic covers. A man (who remains nameless) decides it would be a fun idea to burn a basketful of holly atop a hill (a sure way to kill witches), just for the hell of it, and incurs the wrath of a local coven. The man burns the holly, then hallucinates that he's being chased by a dinosaur and awakens in bed with a pain in his side. His daughter enters with a voodoo doll and explains that a nice old woman distributed exact copies of the doll (along with long needles to poke it with) to all the girls of her Brownie troop. "Bewitched!" is a really silly, meandering tale that doesn't seem to know in which direction to travel. There are hints that Madge, the protagonist's wife, may be a witch herself (shades of ABC's Bewitched, a show that debuted right around the time this issue went on sale in October 1964) but that area is not explored. 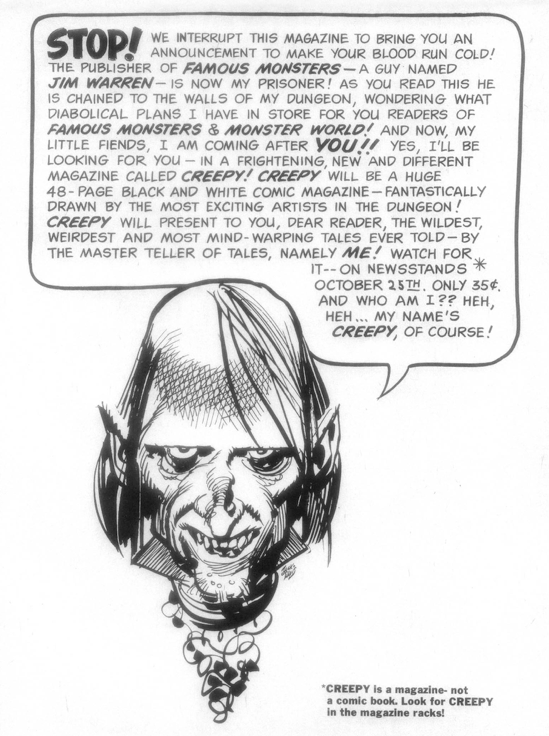 Artist Gray Morrow (who would go on to 1970s' fame, if not fortune, co-creating Marvel's Man-Thing) gives his all despite the script, but there's only so much you can do with a sow's ear. 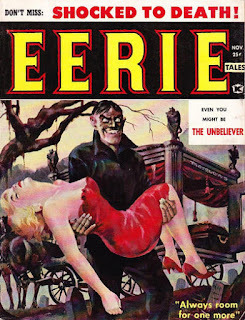 Morrow was a contributor to that aforementioned Hastings zine, Eerie, as were Torres, Orlando, and Williamson. Cartoonist Baldo Smudge worked his way up from the ground floor to "The Success Story" he is today. Smudge began his career ruling panel borders and stumbled onto a good thing when his wife's uncle died and left them with a boatload of money. 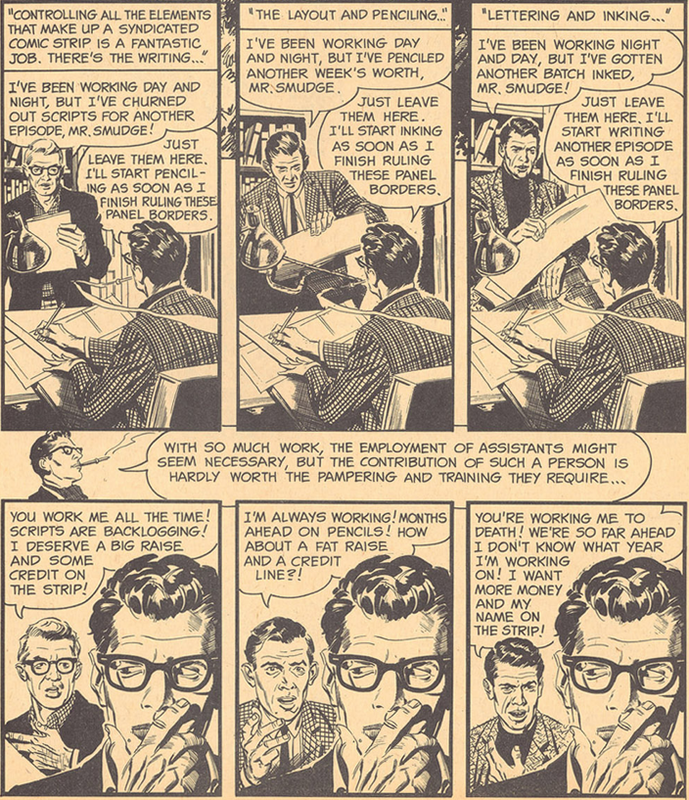 Baldo hires a writer, an artist, and an inker to create and maintain his strip, while taking all the credit for himself. The strip becomes a big hit and the three hired hands demand a raise and credit, but Smudge isn't about to give over any slices of his pie so he shoots all three and dumps them in the river. Several months later, the three corpses rise from the muck and use Baldo Smudge to make their masterpiece. Ladies and gentlemen... the Bob Kane story! Sure, "The Success Story" exaggerates some elements (I think) and devises a nasty ending for the glory hog but, otherwise, this is a true story in the comics world. There were (and probably still are) quite a few "creators" who (à la Tom Clancy and James Patterson) loan out their names for a big cash prize and think nothing of taking the credit right to the grave. "The Success Story" has a lot of humor and the rising corpses are almost an afterthought to Archie's real message. Best of all is the sequence (reprinted here) where Smudge has to deal with his workers. Can it get much better than this? 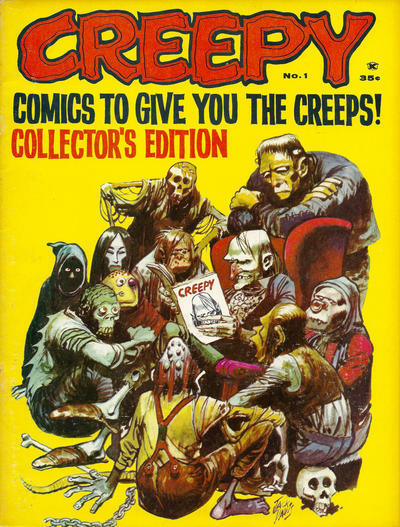 Jack: Never having read a single issue of Creepy before just now, I expected higher praise from you! "Voodoo!" does not get things off to a great start, but I found Orlando's art less annoying than it was at EC and it's a neat trick how Sylvia manages to decapitate herself. "H2O World" seems to me to show some Marvel Comics influence, and by fall 1964 Marvel was putting out some decent comics. 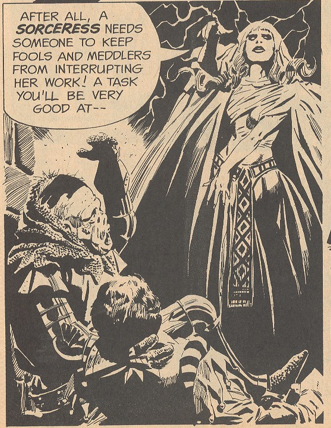 Ivie's script is too talky but the art by Williamson and Krenkel is superb. I was happy to see Reed Crandall make an appearance with "Vampires Fly At Dusk!" but the story was predictable. "Werewolf!" is a dopey tale but it's a real treat to see six pages of classic Frazetta and his work on the wolf is outstanding. "Bewitched!" is the third story by Larry Ivie in this issue and it made me think that he wrote some weird fiction. I love Grey Morrow's work and think he makes a great addition to the bullpen of horror artists. This story seems a bit more original than the ones before it, what with the parade of vampires and werewolves. 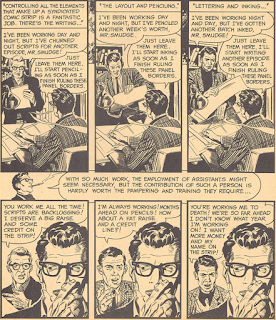 Most original of all is "The Success Story," a funny look at the comic strip business with more wonderful art by Al Williamson. Like you, Peter, I found myself wishing for color. Finally, "Pursuit of the Vampire!" makes one too many vampire stories in this issue; it's not a strong story and the end is terrible, but (again) the art is great. Seven stories at six pages each and those wonderful Warren ads in between! I like it! Harry and Phyllis Gorman have a screaming match outside an arcade that offers "Fun & Games!" Phyllis storms off and Harry succumbs to the entreaties of a hunchbacked tout, going inside to try his hand at the special games in the back room. He shoots a realistic rifle at a dummy that resembles Phyllis, but when he goes home he finds her dead on the living room floor. Harry returns to the arcade, but this time he is the target and Phyllis does the shooting. 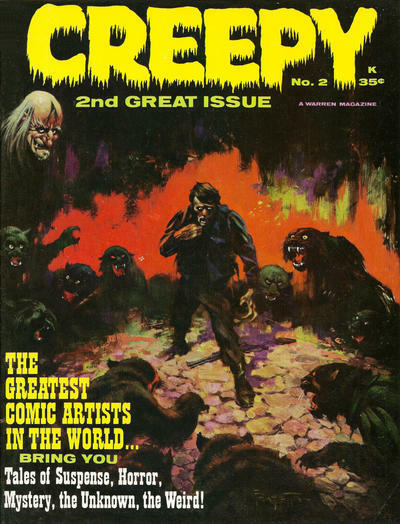 The cover of Creepy #2 promises "The Greatest Comic Artists in the World," notably failing to mention anything about the writers. This first story makes little sense and is all about the twist ending, which is predictable. 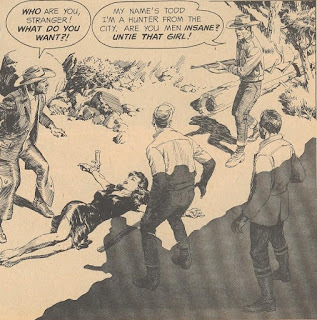 I think Peter would agree that Joe Orlando was not in our list of "The Greatest Comic Artists in the World," though this piece is reasonably well executed. "Spawn of the Cat People"
Todd is hunting in New Mexico when he comes across a strange scene--several men have a beautiful woman tied to two stakes in the ground. 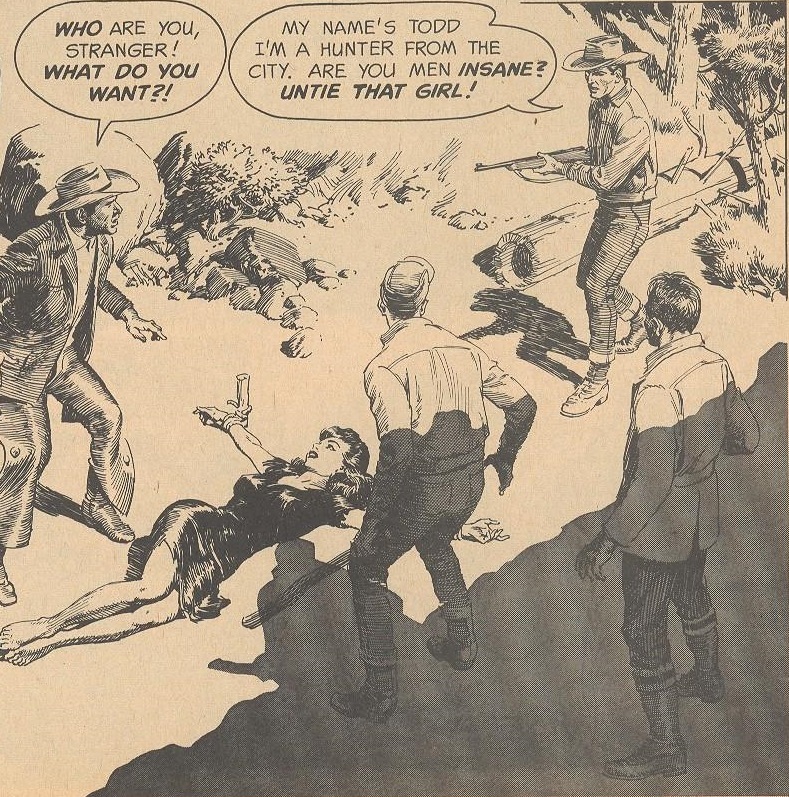 The men tell Todd that they killed the girl's father and that she inherited a curse from him. Todd rescues the girl and she leads him nimbly through the woods until they reach a cave, where he decides that she is able to turn into a cat. He shoots and kills her but, to his surprise, the rest of the men find him and reveal that she was the only one in the area who cannot turn into a cat. They all turn into cats in order to finish him off. 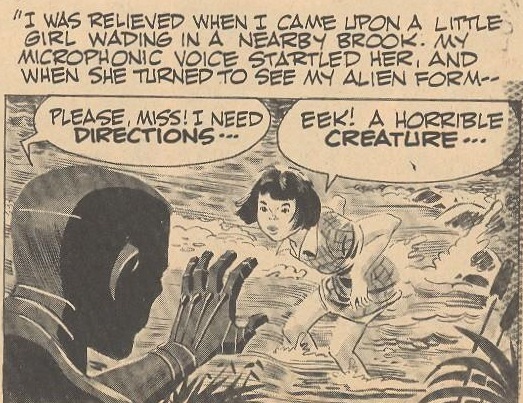 Two weak stories in a row don't make me think the people behind Creepy have solved the conundrum we've encountered with so many horror comics: how to find writing to match the art? Reed Crandall draws everything well but the ending of "Spawn of the Cat People" makes little sense other than as a simple shock. Five men who stole the mummy of Pharaoh Ank-Ummem from a pyramid examine several extra sarcophagi that they found accompanying the mummy. In those ancient coffins they find artificial forms of a vampire, a werewolf, a devil, and Frankenstein's monster! Archaeologist Arnold Baxter translates hieroglyphics and reads that the figures are a "Wardrobe of Monsters!" that the pharaoh could put on like living clothes. Baxter invokes a magic formula and discovers that he can inhabit the forms; one by one, he uses the monstrous bodies to murder his colleagues so he can keep all of the Pharaoh's treasure. He destroys the Pharaoh's body to eliminate a potential rival, only to find that doing so frees the Pharaoh's spirit, which takes over Baxter's physical form, leaving the murderous archaeologist stuck in the body of Frankenstein's monster! 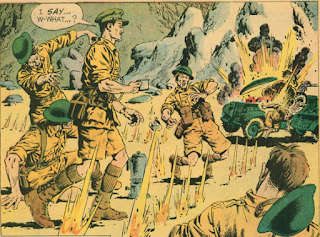 When I read Creepy #1, I wondered where the mummy story was--and here it is! Binder's narrative is quite creative, and the idea of finding a way to work all of these classic (let's face it, Universal) monsters into one story is loads of fun. 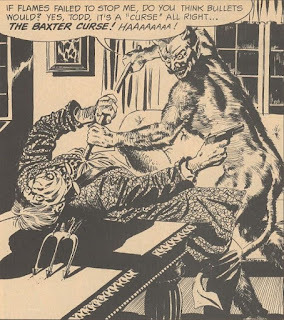 I liked the idea of Baxter taking on one monster form at a time to murder his colleagues, but I thought the denouement was a letdown, as if the page limit was reached before Binder was finished telling his tale. At eight pages, this is the longest story yet; every other one so far has clocked in at six pages. Mark and Randy are out scouting for a movie location when their sports car suffers a blowout of two tires. They see a sign for Jonesville and walk toward the town, looking for a mechanic. 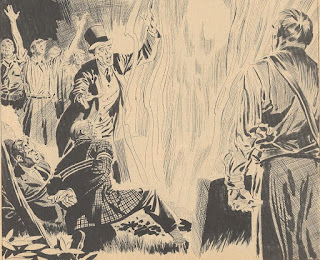 Instead, the duo stumble upon a sacrifice in progress in the town cemetery. A girl is tied to a stake but, when Mark and Randy protest, the townsfolk announce that the interlopers will replace the unfortunate girl. 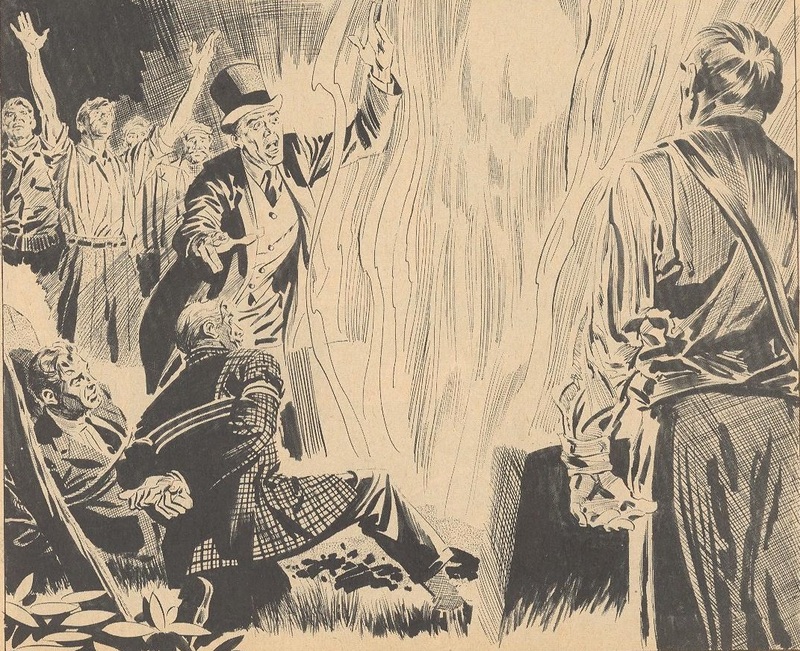 A ghost is summoned out of an open grave amid a pillar of fire; the townsfolk yell "surprise" and reveal that the whole scene was set up to demonstrate the town's fitness as a movie set. Unfortunately, Mark and Randy died of fright when the ghost rose from the grave. 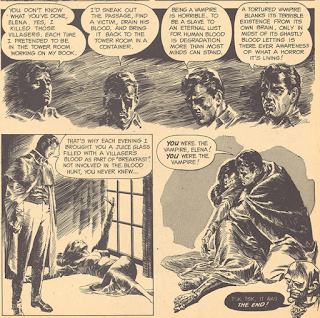 The usual sharp artwork by Al Williamson highlights "Welcome Stranger," a fast-moving but, in the end, disappointing seven-page story that held my interest until the corny ending. Archie Goodwin should've thought this one out a bit more. What happened the day Peter got lost. Dr. Link builds an intelligent robot and names him Adam. The robot learns quickly but, when its creator is murdered, Adam must run from those who hold him responsible for the crime. In the end, he decides to switch himself off to prevent him from harming any of the humans who hunt him. "I Robot" again? What is it about this story that makes it so appealing to horror comic publishers? We had to suffer through Adam Link stories at EC and now here we go again, with seven pages seeming like twenty and Uncle Creepy telling us there will be more to come in future issues. Joe Orlando's art is fairly good for Joe Orlando, which is not saying much. A knight approaches the "Ogre's Castle" where his brother had disappeared on a prior quest. Ignoring the warnings on an old man, the sight of skulls on posts, and the shock of seeing a beautiful girl led by two monsters, the knight crashes through the castle gates, only to meet up with an ogre. The knight defeats guards, bats, and a demon-hound; he rescues a fair maiden and kills the ogre with a well-thrown knife. Sadly, the ogre changes back into the knight's brother and the maiden turns out to be a sorceress, who changes the knight into the new ogre guarding the castle. Peter: With the second issue, staff writer Archie Goodwin steps in to assist Russ Jones with the editing (Jones will jump ship after the third issue and leave Archie as the sole editor as of #4). I've always had a soft soft for Goodwin, as it seems like everything he touches turns to quality. We'll have to see what he's got up his sleeve in a couple of issues. There's not a lot to like in this sophomore effort, just more cliches and tired plots we've seen countless times before. "Fun & Games!" makes no sense whatsoever (it reminded me a lot of that Twilight Zone episode where the guy watches himself kill his wife on TV); "Spawn of the Cat People" rips off the fabulous Val Lewton flick (at least that's a semi-unique "borrow"); "Wardrobe of Monsters!" is overlong and gawdawful; "Welcome, Stranger" is a little too elaborate and owns a very silly climax; and "Adam Link" was a boring SF novelty when it ran in Weird Science-Fantasy and it's no better here (might have to do with the fact that the same crew worked on both versions). That leaves the final story, "Ogre's Castle," the best of the six this issue. 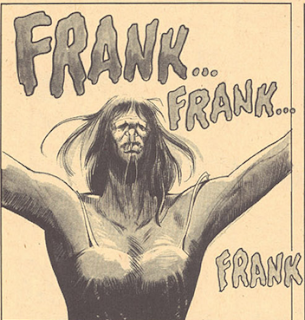 I first read this one when it was reprinted in Eerie #42 (by 1972, Warren had abandoned their annual yearbooks and incorporated a full-reprint issue within the regular numbering); Angelo Torres's art gave me the willies back then and it still does. It's got a really nasty twist and ends on a downbeat note to leave the issue on an upbeat one. * By the way, we're getting most of the historical details (who did what and how many times, etc.) from Gathering Horror by David Horne (Phrona Press, 2010), a gargantuan, insanely detailed guide to all things Warren. I'm very glad you got around to Warren. I'm pretty sure it's a long wait (early ' 70's, I think), but they did eventually do color stories for each of their titles, about one per issue. That, to me, is the Golden Age of Warren, the mid-1970s, when they brought in the Spanish artists. I've got so many vivid memories of reading some of those Creepy stories as a kid. Looking forward to rereading them (next year, by the time we get to them!). And thanks for sticking with us! Very happy you've started up your Warren coverage! As big a fan of EC I am, I like Warren even better (granted, Warren has an advantage in that it produced far more issues and stories and could draw from a far larger pool of creative talent). I own original copies of nearly every non-reprint Warren horror magazine ever done (maybe missing around 10 or so issues) and its always a blast going back to read them. Looking at these first 2 issues, much like with EC, it takes a little bit for Warren to kick up the quality, although in Warren's case it comes a lot quicker, largely from Archie Goodwin taking over as editor which I think we will see as soon as your next post. 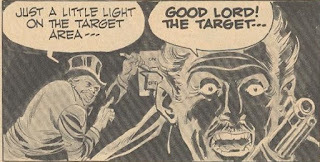 Right from the start there is a big difference one sees with Warren's stories versus EC's, they avoid the super text heavy style that was a big thing of Al Feldstein (one of the few EC artists who never did anything for Warren, along with Graham Ingels, Bernie Krigstein and Jack Kamen). These stories are a lot more digestable and go by a lot quicker than the stories in EC. Its a good thing we get 2-3 more stories an issue than we got in EC. The big find as far as I'm concerned with these early issues of Warren is Angelo Torres, who did hardly any work with EC (a few shared stories with Williamson and his only solo story got axed by the Comics Code), but really shines here. It is quite the pleasure reading his stories and he does an excellent job in all of them. 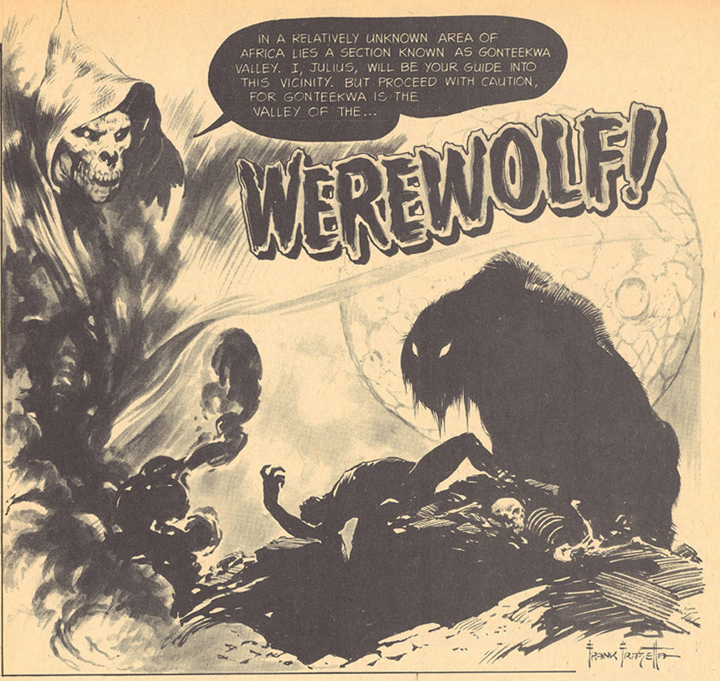 Gray Morrow is the one artist in these early issues that didn't do any work for EC (I hear they originally wanted Wally Wood to do Bewitched, but he wasn't available). He also does an excellent job and his art resembles Torres' quite a bit. Torres actually drew the last page of "Wardrobe of Monsters", although he wasn't credited. "Success Story" is my favorite story of these 2 issues. 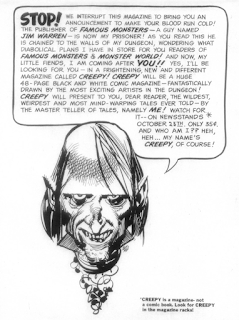 The whole thing about famous names renting their names out will even come up later in Warren, there are a number of stories credited to Joe Orlando we'll see later on (around the time when Eerie starts up) that were actually drawn by Bill Draut or Jerry Grandenetti instead. Smudge's look is also based on Williamson himself. I enjoy "Wardrobe of Monsters" a lot too. 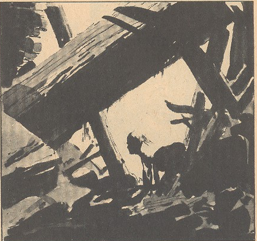 H20's artwork by Williamson and Krenkel is quite strong. Of course it can't get better than Frazetta so his sole Warren story here is quite the sight to see. It also, oddly enough features a host named "Julius" who never appears again. 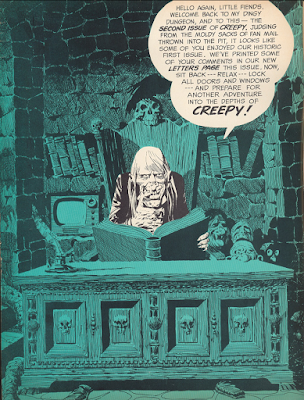 Like you Peter, my favorite age of Warren is when they bring in the Spanish artists, who produce what is probably the best horror comics art I have ever seen. Alas, that is a very long time off! Do you guys have any plans of covering Blazing Combat as part of this feature? Still have my early run of Creepy/Eerie/Vampirella's that I bought off the news rack when they were first published. 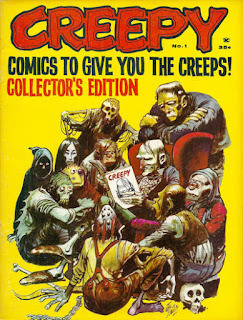 I traded my copy of Creepy #1 around the block (probably for comics) until it landed back in my hands. It's hard to describe the thrill of reading those first stories as compared to looking at them retrospectively. Yes, they got right to the point and eschewed the verbosity that the typeset EC stories were known for. I credit Goodwin for keeping Creepy alive and Warren for attempting something like this in the first place -- it was just what the Mad Doctor ordered back then. As a contributor to "The Warren Companion", I am honored to be a small part of the legacy. Vampirella was one of the first American comics I bought at international press newstand. But this was rather late, no. 60 I think. Vampi was amusing, even if the stories mostly were ridiculous, but it was the rest which was fun. Wonderful artwork, everything so different then, say, DC or Marvel with its horror books. Back then I knew nothing about comics and didn't realize it was mostly spanish art, but I couldn't get enough of Ortiz, Auraleon and the rest. The Captain Company was also a relevation, I ordered a few books, which back then was kind of risky and a lot of hassle. You never knew if the order arrived. But the Captain Company never failed. Vampirella I bought till the end, unfortunatly I sold most of them. Today I have the Archive Edition out of nostalgia. Over the years I bought some Eerie and Creepy, mostly for the art. Corben's Poe adaptions, the Wrightson issues. The early issues are quite different then the later years. The big find indeed is indeed Angelo Torres. The stories may be so-so, but the art is a joy. I discovered the Warren mags in Summer 1974 (starting with EERIE 59) and absolutely adore the Dubay Era. In addition to the brilliant Spaniards (Maroto, Ortiz, Fernandez, Gonzales, Sanchez et al) there was absolutely stunning stuff from the good ol’ US of A too — Wrightson, Toth, Corben, Severin, Wood, Jeff Jones, Neal Adams and Russ Heath. Q99: Thanks for your comment. Peter knows these mags by heart but they're all new to me. 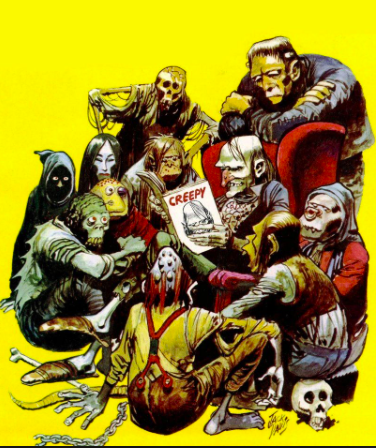 I bought Famous Monsters on and off in the '70s and had every issue of The Spirit till I sold my set recently. We will be covering Blazing Combat! John: Glad to have you along for the ride! That's cool that you contributed to The Warren Companion. Please keep us apprised of your expert opinions and bits of knowledge! Andy: Thanks for stopping by and leaving a comment. That's interesting about The Captain Company. Ordering something from the back of a comic or a mag was a thrill when we were kids! B.T. : Thanks! I started reading these sort of mags (though not the horror ones) around '74 as well. We moved out to the suburbs in '73 when I was 10, I got a bike, and suddenly I could ride to the stationery store and buy my own comics! A whole new world.